The New Offset Spoons Are Here! They’re here at last, the reason Mac and I began this venture, the offset spoon, aka the Basting Tasting and Saucing spoon. These are the most versatile spoons in the kitchen, beautifully balanced, gorgeously designed, incredibly practical. My son James shot and did most of the editing on this video, for which I’m grateful; thanks James. We’re getting there. I daresay the spoons are of a better finished quality than the video! But we try! They’re only available from me at opensky, my partner in internet shopping. If you’re interested in the details, or are interested in other Dalton-Ruhlman tools as well as other products I recommend, go to my tools and specialty foods page at opensky.com. My post introducing the Ruhlman/Mac new kitchen products. Seven Spoons is a food blog that has great photos, interesting stories, and great recipes that are all written by Tara. Learn a bit more about spoons, by learning the history of the spoon. © 2011 Michael Ruhlman. Photo © 2011 Donna Turner-Ruhlman. All rights reserved. Hi Michael, love your books, love your blog, in fact…love the spoons!! Until I find out that Opensky cannot ship to Canada. Perhaps you could use your influence to get that little snag fixed. You have fans to the North too my friend!! within a month i hope to be able to make these available internationally. That would be excellent. I joined opensky and discovered that, obscurely hidden, right at the end of the FAQs, they do not ship internationally but are very happy to send a rediculous number of emails a day… Not my favourite. I just want some offset spoons. Thanks. Okay, it is fun that the kid is helping with video, and his little screen capture stating that this is almost over is fun… but be careful. That music is under full copyright protection and using it in a video will incur costs. Maybe it is time for James to start composing some original music in GarageBand! oooo, hadn’t thought of that. thanks. will tell james to learn garage band! Good question, Susan. I would like to know too. You’re using the CIA hand towels! We still have ours as well. PS. Garage Band is a cinch. agreed, for years i used bent spoons, and if you have to choose between these spoons, and rent money, I’d go with the rent. but none of my spoons were very elegant, and they weren’t the right size. I’ll bet you don’t have a big basting spoon like the one in the video. If we sell enough of them, then we can def. get the price down, which i agree is high. but it is what it must be for us to produce them for now, and they really don’t exist elsewhere. Usually when I find a nice spoon that I like at an antique store I have to pay 10-15 dollars for a single used spoon. I love these!! I posted a question up on your FB page about them as I am poised to order them. I’ll ask it here too since it looks like you’re pretty active in this stream. My OpenSky email this morning says “was $28; now on sale for a limited time.” Yet when I went to buy them, the price is still $28. Are they supposed to be at a reduced sale price today, or was my email incorrect? Thanks! What’s with the caption @ 1:13 in your video??? Loved the video. Could best be described as exuberant! Kids have so much energy that is comes through in everything they do. I hope this is an ongoing collaboration as I’d love to watch him mature through his videos. So glad you’re doing your own products! I’m going to be offering my own food products on Open Sky in just a few months. Where are your spoons fabricated, and by whom? What kind of steel are they using? This information is not available on OpenSky, and I think it’s important. Especially considering the price point you’ve set. Great video. Love the usage of the Rocky theme music. Very appropriate for any epic cinematic moment. Oh and the spoons look great too. Could you please share the technique for the whole cauliflower head you were basting in the video? It looks delicious. Is there some option on Opensky that I’m missing to build an order of several different items. I was looking to buy a few different things and it wanted to sell and ship them to me seperately with me paying for shipping for each item individually. First online store I’ve seen where I can’t put all the items into a single order with a single shipping cost. 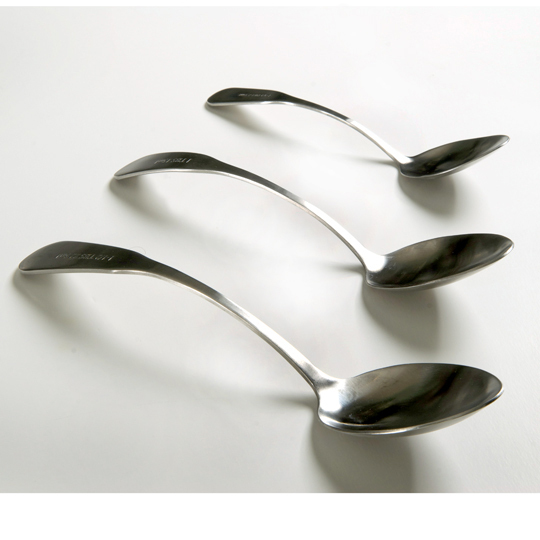 I really want these spoons but Opensky says the sale is closed? I thought these just came out? Ahhh ship to Canada!! there is alot to be said for a tasting spoon that dosent cause your knuckles to go into hot sauce in a rush! Another good thing about these spoons is they are perfect for digging into deep jars and containers like mayonnaise, sour cream or whatever. The stem of the spoon doesn’t get all gunked up and your hands don’t get messy. Love them. Looks great Michael. 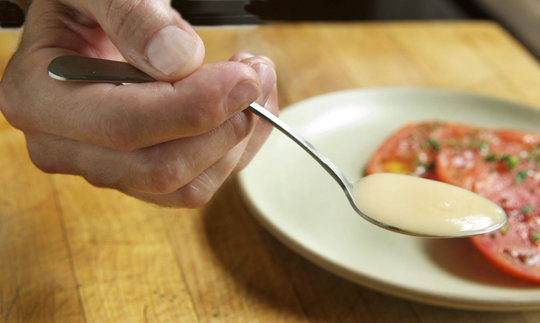 Have you thought about designing a perfect quenelle spoon? I think that would be a product in equal if not higher demand. Another Canadian fan with a question: Any chance you’ll open up the spoons to a la carte pricing? Or creating a set of 3 large spoons? The large spoon is what I’d love to get…and give.